The owner of the private property must provide a written authorization to the towing company asking them to tow the vehicle away. This should only be done if there was a post indicating that unauthorized parking is prohibited on the property. The towing vehicle must have a ‘Tow Away Zone’ sign where it will be clearly indicated that the owner of the vehicle being towed will pay the expenses. The name and the contact details of the company involved in the towing should also be indicated on the towing sign. 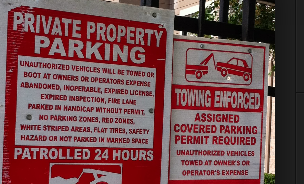 If the owner of the vehicle had previously been given a notice indicating that the place where the vehicle is parked is private and unauthorized parking is not allowed, there will be no need to place a tow away sign on the towing vehicle. The towing vehicle should clearly indicate the name, permit number, address and the phone number of the company involved in the towing. This should be written on both sides of the towing vehicle. The yard on which the towed vehicle will be taken to should be open during the normal working hours except when on holiday. If the owner of the vehicle demands the release of the towed vehicle before or after normal working hours, he should be allowed to access the vehicle in one hour after making the request. The owner of the vehicle will then inspect if there are any damages on the vehicle before taking it from the yard. The charges will depend on how much the vehicle weighs; this may vary depending on the towing company as some will charge more than the others. If the owner of the vehicle gets to where he had illegally parked his vehicle before the actual towing takes place, he will only pay half of the expenditure he would have incurred if the actual towing took place. After the towing has taken place and parked in a yard, parking charges will be applied if the owner fails to come for the vehicle after six hours have elapsed. If he picks the vehicle before the end of six hours, he will only be charged for the towing. If the owner of the towed vehicle is not known and the towing company is forced to conduct a research when establishing the owner, a research fee will be charged. As a resident of North Sale Lake, you should ensure that the place you are parking your vehicle allows parking to avoid incurring unnecessary costs. Read the signs in an open area before parking so that you will know if there will be a need to ask for permission to park. In case your are notified of the towing away of your vehicle without your consent, ensure that you go for it before the towing start charging other fees like the parking and administrative fee.